The Tension Fabric Displays offers some great advantages over the old school pop-up display backdrop. This new Pop Up Display killer is extremely lightweight and compact for easy transport. With our most vibrant custom printing, huge full color display could now be setup cost effectively for Trade Show Booth of any sizes. The aluminum frame is fast and easy to setup, and the elastic fabric material simply slips over the top and zipper places along the base to create a perfect tension trade show. Just one person is required to complete the setup in minutes. Why Tension Fabric Displays are becoming more popular than the classic pop up display? Use our # ONE Economy Tension Fabric Displays to setup your Trade Show exhibits, with a large custom graphic prints. This fabric print is one of the most effective ways to show off your company's information and product details to your potential customers. The ultra-lightweight and compact system let you travel conveniently over United States nationwide, or even to the world shows aboard. Although there are many different Audio Visual displays that are being designed for high demanding exhibitions, they might probably be too complicated in setting up for a few days Trade Show. These over advanced systems are probably over the budget constraints for most small business. So a cheap pop up display is still the most popular and cost effective Banner Stand in setting up a Trade Show Display. You just have a few seconds of time to catch the attention of a Trade Show visitor, to make him to stop at your Trade Show Booth. 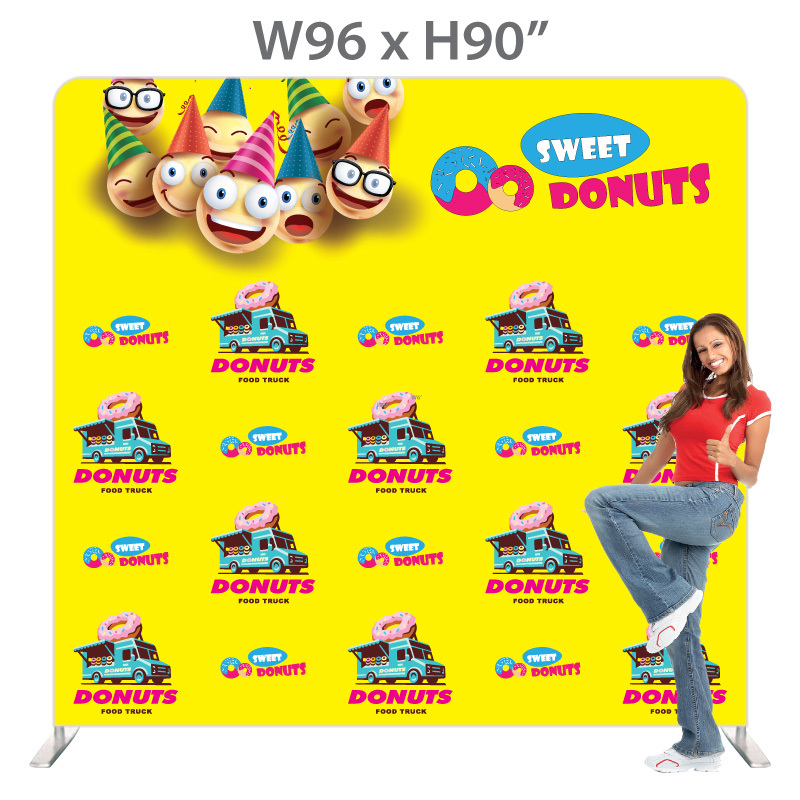 Our Tension Fabric Displays let you setup a high backdrop graphic display in just minutes. Large 8x8, 8x10 or other even more bigger graphic are available to maximize the exposure of your products. The logo, graphic and pictures would be easy to read on the huge backdrop display. The big pop up displays would capture your audience attention, then next is to setup your product samples properly along in the booth. Optional lighting effect could be setup to escalate the professional image to a next level. We also have accessories for setting up display screen and ipad for multimedia enhancement of your booth.